Today I found out that the man who is credited with inventing Doritos (which incidentally means “turned golden / crisp”) had the chips sprinkled over his grave when he died. Archibald Clark West was born to Scottish immigrants in Indiana in 1914. With his mother too poor to take care of him, he was raised in a Masonic home after his father passed away. In a true “American dream” story, West was able to take a step above his impoverished roots when he was offered a scholarship to Franklin College. He graduated in 1936 with a degree in business and went on to serve in the navy during World War II. When he returned from war, he put his degree to use by working as a traveling sales representative and then worked on advertising campaigns in New York for Jell-O. By 1960, he found himself working for Fritos in Dallas, Texas. That’s when his fortunes really took off. The idea for Doritos was conceived in Disneyland, of all places. It wasn’t West who actually first made them, either. The original Doritos were made in Casa de Fritos, a restaurant owned by the Fritos founder, Elmer Doolin. The restaurant was located in Frontierland and served standard Tex-Mex, with every meal boasting a complimentary bag of Fritos. The restaurant was a hit, but it didn’t make its own tortillas, a job which was contracted out to Alex Foods. It was a salesman from Alex Foods who saw discarded tortillas at Casa de Fritos and told the cook he should fry them up and make tortilla chips out of them, rather than just throw them out. Because tortilla chips weren’t yet made by Fritos, and Fritos themselves were given out with the meals, Casa de Fritos hadn’t thought to offer them like other Mexican restaurants did. Not to be deterred, he managed to finagle some funding from other projects the company was working on, which allowed him to make and test out the product, first making taco flavoured and plain corn flavoured, the latter of which remained tied for his favourite throughout his life owing to being good for dipping. (His other favourite was “Cool Ranch”.) After selling them locally and seeing the chips hugely popular, the other execs were finally convinced and decided to move forward with selling them nationally by 1966. West retired from his position as vice president of marketing for Frito-Lay in 1971, but remained committed to Doritos and even continued testing out new flavours over the years. He died in 2011, just a year after his wife of 69 years passed way- in his case dying of complications of vascular surgery at the ripe old age of 97, having risen from a child of poor immigrants to the force behind one of the best-loved crunchy snacks in the world. At his funeral, his family tossed Doritos chips into his grave so that his favourite snack could always be with him. “Fritos” comes from the Latin “frictus”, meaning “roasted, fried”. By 1972, other flavours were created, including the ever-popular “nacho cheese” flavour which was an instant hit. Today there is also the somewhat questionable “Clam Chowder” Doritos you can buy in Japan if you’re feeling adventuresome. A few months before he died, West himself tried out the “Late Night All Nighter Cheeseburger” flavour… and spat it out—I guess that one doesn’t come with his seal of approval! In 1994, Doritos underwent a costly redesign despite accumulating around $1.3 billion in sales the year before—about a third of Frito-Lay’s income that year. The redesign was meant to make them compete more with Mexican restaurant-style chips, which were “larger and more strongly seasoned” than Doritos were at the time. The chips were made 20% larger and 15% thinner, were more strongly seasoned, and had their edges rounded to make for easier eating. While he was working at Fritos, West became friends with a Mr. David Pace of Pace’s Salsa and Picante Sauces. Sales were slow for Pace at the time, and he turned to West, knowing he had some advertising experience, for advice. West made the simple suggestion of having the products placed beside chips rather than in the ketchup aisle with other tomato-based items. Pace followed that advice and skyrocketed. Doritos are sold in over twenty countries worldwide. 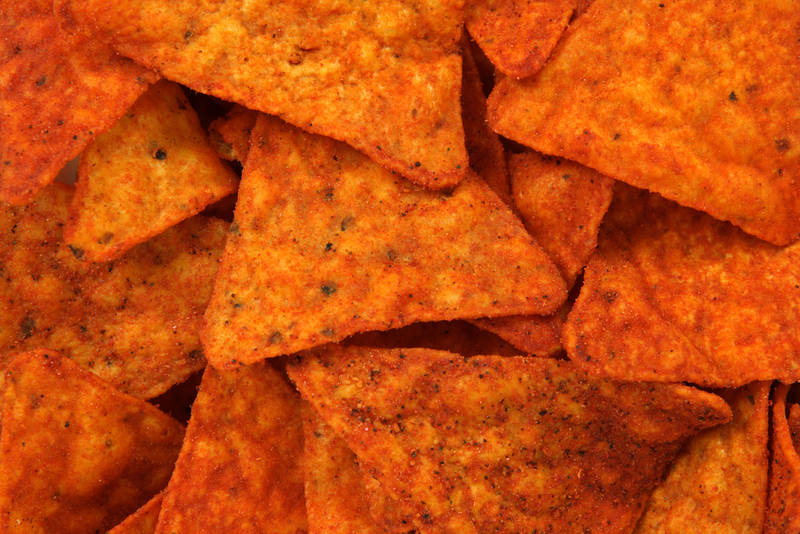 Doritos weren’t available in New Zealand until 2010. The chips were launched in the country with nacho cheese, cheese supreme, salsa, and salted flavours. Doritos list so many ingredients that The Onion published an article in 1996 titled “Doritos Add One Millionth Ingredient” to poke fun at the ridiculous number of things that go into making the chip.